Their houses are built of cedar planks and in shape, similar to the one already described, the whole range, which is six hundred and forty feet long by sixty broad, is under one roof, the front is eighteen feet high and the covering is slanting: all the apartments which are separated by partitions are square, except the Chief’s, which is ninety feet long. In this room the posts or pillars are nearly three feet in diameter at the base and diminish gradually to the top. In one of these posts is an oval opening answering the purpose of the door through which one man may crawl in or out. Above, on the outside, are carved human figures as large as life, with other figures in imitation of beasts and birds. The first Europeans to stay in the area permanently were the traders of the Hudson’s Bay Company (HBC). In 1827, Fort Langley was built on the banks of the Fraser River, in the area now known as Derby Reach. It was one of a string of trading posts built up and down the Pacific Coast to compete with American fur traders for the rich pelts available in the region. Farming as well as cranberry and salmon exports soon replaced fur trading as the fort’s primary source of income. The first fort (1827-1839), built with two bastions, a wooden stockade and several buildings, proved to have been built too close to a fast-moving part of the river, in an area prone to flooding. It was rebuilt in 1839 farther upstream. As the HBC’s network of forts in the interior grew, Fort Langley became a hub for farming, smithing and for shipping furs back to Europe. Along with farming, the export of cranberries and salmon would soon become the fort’s main source of profit. In 1858, gold was discovered in the Fraser River in what is now the interior of British Columbia, and the fort also became important as a supply station for the miners heading up the river toward the gold fields. With thousands of gold prospectors, many of them American, streaming into the region, the British government created British Columbia as a colony. James Douglas was sworn in as the new colony’s first governor in Fort Langley, but New Westminster was chosen as the capital, as Fort Langley was less defensible from an American invasion. When the gold rush ended, Fort Langley’s importance began to decline. The Hudson’s Bay Company subdivided and sold the farm it was occupying on Langley Prairie. Farming and logging took over as the dominant local industries. In 1870, Paul Murray settled what is known today as Murrayville. Together with his sons he owned a quarter section of land on each of the four corners of Yale Road and what now is 216th Street. At that time, this area became known as “Murrays corner” after Alexander Murray, who drowned in the Fraser River in January 1884 while attempting in vain to save a friend. 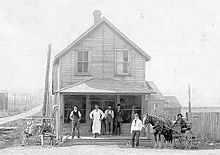 In 1925, the post office named it “Murrayville”. The area between 216 street, 216A street, 48th ave and 48A avenue is one of the oldest subdivisions in Langley. Of the eight building lots in this subdivision there are still 6 heritage houses (built before 1930). The Township of Langley was incorporated on April 26, 1873, with James W. Mackie as its first elected warden. Over time, New Westminster and then Vancouver developed into urban centres, but Langley Township remained predominantly a rural community. The growth of transportation continued to connect Langley Township with its surroundings. The British Columbia Electric Railway was built through the community in 1910, followed by Fraser Highway in the 1920s, and the construction of the Pattullo Bridge in 1937, all adding to Langley’s importance. In 1955, however, residents of the downtown core (then called Langley Prairie) demanded services that the municipal government was not willing to provide (namely, street lights), and on March 15, 1955, the City of Langley incorporated as a separate municipality. Langley’s growth increased during the economic boom after the second world war. In 1957, Langley Township, along with other municipalities in British Columbia adopted the grid system for the road network. In 1967, Langley Township became part of Metro Vancouver. As with many other parts of Canada and cities in the United States, the Vancouver region expanded with the growth of the suburb. With the completion of the faster Trans-Canada Highway route in 1964 in the north of Langley, suburb communities such as Walnut Grove appeared in Langley which were popular with commuters. Most of this growth happened outside of the original communities of Fort Langley and Murrayville, instead happening adjacent to Langley City and near the Trans-Canada highway, likely due to the influence of private automobiles. In February 2006 the Township of Langley moved its Municipal Hall from the “core area” of the Township to the growing Willoughby area. The new facility also includes a new library, fitness room (which incorporates a special type of hardwood floor room) and a new community policing station. Since the 1980s, Langley City and surrounding lands administered by the Municipality have been subject to extensive strip mall development. The old town core remains pleasant to walk through, but many core businesses (including the civil courts and several banks) have moved to the malls, fostering an automobile-dominated community. In addition to this, the community allowed extensive strip development along the Langley Bypass, which has become the new sprawled business area of the city. In the 1990s, the Village of Fort Langley has undergone a revitalization of its core that enhanced its heritage character. In fact, there are no franchises permitted in the village and this has raised its profile as a tourist and independent retail destination with hundreds of thousands of annual visitors. A rowing facility completed in 2009 brings a whole new segment of visitors to the area. Construction of the Golden Ears Bridge has been completed and opened to traffic on June 16, 2009. The bridge spans the Fraser River and connects the Township of Langley with the communities of Maple Ridge and Pitt Meadows. In addition, the plan for the Carvolth Neighbourhood in Willoughby is promoting the construction of new office buildings in proximity to Highway 1 and 200th Street. Fort Langley has the distinguished title of being “The Birthplace of British Columbia”. The Fort Langley National Historic Site, which puts on events and exhibits relevant to the history of the area, is open to the public. Additionally the village itself has areas of historical interest. Elsewhere in Langley is the Twilight Drive-in – a drive-in movie theatre, the Canadian Museum of Flight, numerous parks, rivers, and horse farms. The Otter Co-op is a major commercial and agricultural centre for the community of Aldergrove. In South Langley is Campbell Valley Park, a large Metro Vancouver Regional Park. Within the park boundaries are the historic Rowlatt Farmstead, clearly visible logging railway grades, and the historic Lochiel Schoolhouse. Langley takes part in British Columbia’s wine-making tradition and has many wineries with a temperate climate which allow grapes to grow. This includes places such as the Fort Wine Co. in Fort Langley, and Vista D’oro winery in the south, both of which have produced award winning wines, with the latter reaching international acclaim at the Shanghai International Wine Competition 2012. All wineries across Langley are open to the public for tasting and buying of wines, but individual opening hours vary. A map of Langley showing the locations of Wineries. In the agricultural areas of Langley, farms produce a variety of fruits and vegetables, meat, dairy and eggs. It is not unusual to see signs on the roadside advertising fresh produce sold direct from the farm. The Langley Circle Farm Tour is a popular way for tourists to experience the various farms and see what Langley produces. Alpacas are farmed in Langley, Kensington Prairie Farm retails an array of specialized alpaca products including rovings, yarn, socks, toques, mitts, scarves, shawls, apparel and housewares. Langley is also home to the Vancouver Stealth of the National Lacrosse League, Vancouver Giants of the Western Hockey League, the Langley Rivermen of the British Columbia Junior Hockey League, the Langley Rams of the British Columbia Conference of the Canadian Junior Football League who are based at the MacLeod Stadium, the Langley Blaze of the PBL Premier Baseball League and the Trinity Western University Spartans in Canadian Interuniversity Sport. There are several ice-rinks in town, including the George Preston Centre in Brookswood, the Sportsplex in Walnut Grove, and the Aldergrove arena. There are public swimming pools located at the Walnut Grove Community Centre, the W.C. Blair Recreation Centre in Murrayville, and the Fort Langley Outdoor Pool. The Al Anderson Memorial Pool is also nearby in Langley City. The Langley Ukulele Ensemble is one of the more noteworthy cultural acts to be based out of the district. With a local equine industry valued at over $60 million annually, the Township of Langley has become the Horse Capital of BC. As of 2006, Langley farms represented 7.2% of the provincial total of horses and ponies. Langley Township is served by the School District 35 Langley. It also contains one francophone elementary school, which is part of the province-wide CSF (conseil scolaire francophone), School District 93, and there is the Langley Fine Arts School in Fort Langley. The largest school in Langley is the Walnut Grove Secondary School which has about 2000 students. Langley is home to one campus of Kwantlen Polytechnic University, and to Trinity Western University, a private Christian liberal arts university. 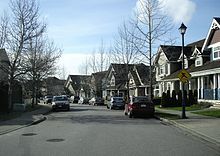 As with other districts in the Fraser Valley, Langley uses a Streets and Avenues grid system, where streets run north-south, and avenues run east-west. 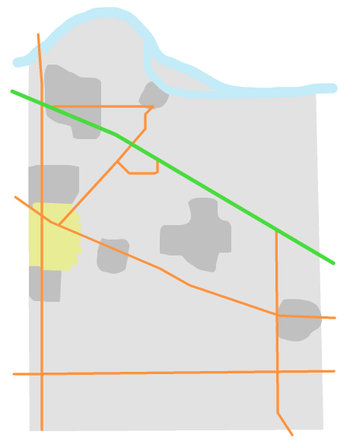 Not every street or avenue runs straight through to the next road in the grid, in Langley typically every 8th interval is a major road (e.g., 216th St., 224th St., 232nd St., etc. ; 16th Ave., 24th Ave., 32nd Ave., etc.) creating a pseudo-superblock with a less predictable street layout inside, though this is not an absolute rule – in more densely populated areas major roads are more frequent, such as every fourth interval – 64th Ave., 68th Ave. and 72nd Ave. in Willowbrook are examples of this. 0 Avenue is along the U.S. border, and avenue numbers are incremented based on eight per mile (1.6 km), so for example 80th Avenue would be 10 miles (16 km) from the border. Street numbers also increment eight per mile as they go further east. There are roads that break this system such as Fraser Highway, Glover Road and Old Yale Road, because they existed before the grid system was introduced. Many of the old road names have been replaced with numeric designations, however Heritage and Pioneer markers installed by the council are placed on many of the roads to highlight their original name. Highway 1, also known as the Trans-Canada Highway, cuts through the northern part of Langley. The Walnut Grove and Willoughby communities are popular with commuters due to being the most developed areas with the easiest access to the Highway. By road, the highway is the fastest method of reaching Vancouver and all the cities along the route, such as Surrey, Coquitlam, New Westminster and Burnaby. Depending on the traffic volume it can take between 25 and 35 minutes to enter Vancouver city limits. For reaching Downtown Vancouver, drivers can exit at Hastings Street and continue westbound into the downtown core. In 2012, upgrades to the highway in the Langley and Surrey region have widened the highway by two lanes in each direction – one new HOV lane and one new regular lane – which has reduced traffic congestion. In addition to this there are HOV exits which provide direct access into the communities for Buses, Motorcycles and Cars with more than one occupant. In addition to the four interchanges, three vehicle overpasses – at 208th Street, Glover Road and 248th Street – cross over the highway. An overpass carries rail traffic exclusively a few hundred metres east of Glover Road. Fraser Highway used to be part of the Trans-Canada Highway, but was replaced in 1964. It is a major road that runs from the centre of Surrey, through Cloverdale, the City of Langley, Murrayville and continues on to Abbotsford. While the speed limit between Langley and Abbotsford qualifies as highway speed at 80 km/h, between Langley and Surrey the speed limit is primarily 60 km/h with the route having frequent traffic lights. This usually means longer travel time than using Highway 1 to reach Surrey City Centre. However, since Fraser Highway goes directly between urban centres, it remains a popular route. 200th is the longest street that runs through Langley, and is a major traffic artery. It starts at 0 Avenue at the U.S. Border (as Carvolth Road), up through Brookswood, into the City of Langley centre, and continues north through Walnut Grove to the Golden Ears Bridge which leads into Pitt Meadows and Maple Ridge across the Fraser River. Langley is situated directly north of and along the United States border, with Washington State to the south. The northernmost point in Langley is less than 25 km from the border. 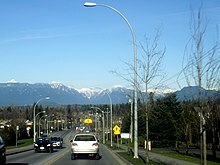 Langley contains one of the five lower mainland border crossings in the community of Aldergrove, however British Columbia Highway 15, which only 3.5 km to the west of Langley in Surrey, leads to the larger Pacific Highway Crossing. Crossing the border here is often faster due to having more open crossing lanes including NEXUS lanes which offer faster crossings for those opted into the NEXUS program. The region is served by TransLink which provides bus services connecting Langley to its neighbouring cities. The largest transit hub in the Township of Langley is Carvolth Exchange – a Park and Ride bus terminal situated next to the Trans-Canada Highway on 202nd Street which provides service to various parts of Langley and the lower mainland. Notable is the #555 service, an express bus that connects Langley to Lougheed Town Centre Station in Burnaby crossing the Port Mann Bridge. This route uses the HOV interchanges on the highway, stopping at Surrey (via the 156th Street HOV interchange) and using the Government Street and 202nd Street HOV interchanges to leave and exit the highway. Langley is serviced by Langley Municipal Airport, a small controlled airport with no scheduled service. Harbour Air, the largest float-carrier in the world, formerly served Langley with scheduled service but terminated these flights due to low passenger numbers in 2011. The Langley Airport is also home to the Canadian Museum of Flight, as well as SkyQuest Aviation and Vector Aerospace, a helicopter maintenance and modification contractor. The city is served by four railways: Canadian National Railway (CN), Canadian Pacific Railway (CP), Burlington Northern and Santa Fe (BNSF), and the shortline Southern Railway of British Columbia (SRY). There are no passenger rail or light-rail links to or from Langley. The Surrey council has proposed a light rail system linking Surrey to the City of Langley with rail along Fraser Highway. 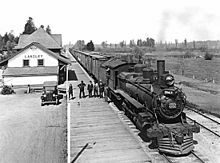 There have also been talks of running passenger trains along the existing rail lines to Fort Langley or Milner. Neither of these ideas have yet to be developed. These are the communities and neighbourhoods recognized by the Township of Langley. For a list of all communities, see Neighbourhoods in Langley, British Columbia. Aldergrove is a small community centred on Fraser Highway. It is home to the Greater Vancouver Zoo. 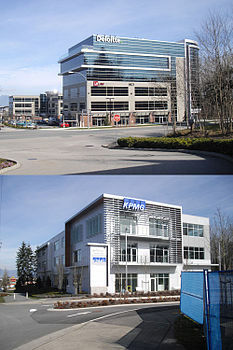 Brookswood is a community to the south of the City of Langley. It is a mostly residential area, with Brookswood Village on 200th Street and 40th Avenue featuring independent stores as well as larger chains. The small neighbourhood of Fernridge used to be a farming area. It is now a small centre with two gas stations, a grocery store and a pub. This is the location of Campbell Valley Park. 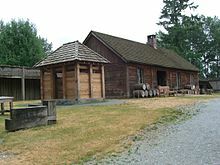 Fort Langley is a historically significant community in Langley, located in the north of the District Municipality. Originally a trading post for Hudson’s Bay Company, today it is a small village with restored colonial style buildings dating to the late 19th and early 20th centuries. Glover Road, being the main road that runs through the village, is notable in the area for having large tree lined streets and being home to many small independent businesses in the village centre. 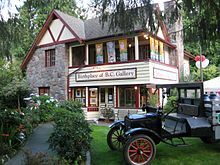 Milner is located along Glover Road towards Fort Langley, and along the British Columbia Electric Railway. It features areas of historical interest, such as an old Hopper car loader, and a 1950s Texaco gas station. Murrayville is another historically significant community in Langley, being founded in 1870 by Paul Murray as “Murrays Corner”. It is notable in the area for its older buildings and roundabout in the centre that intersects Old Yale Road. Residential property there is typically on larger lots than in some of the newer developed parts of Langley. It is also the location of Langley Memorial Hospital which serves the city. Located in the north of the district and south of the Trans-Canada Highway, Willoughby is a mixture of new developments, and undeveloped rural land. At the centre of Willoughby is the new Willoughby Town Centre development. It is also the location of the Langley Events Centre. 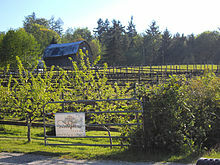 Walnut Grove is located north of Willoughby and the Trans-Canada Highway, and west of Fort Langley. It is a more established developed area, with many supermarkets and shops, and easy access to the highway making it desirable for commuters. The Township of Langley is administered by an eight-member council and a mayor. All members of council are elected to four-year terms in elections that take place in late November. 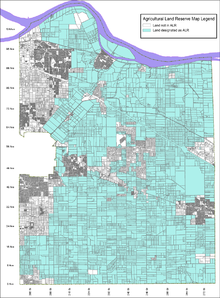 The majority of the land in the Langley Township is designated as Agricultural Land Reserve (ALR), shown as Light Blue on this map. This restricts the way the land can be used. ALR was introduced in 1973 to preserve fertile land and support local farming.